in my collection since I decorate cakes. All from my June 2011 trip. You might recall that Kyle and I made a video of us opening some blind boxes at Downtown Disney. You'll notice we mention "traders" as we talk through the video. That means we opened a Vinylmation we're not crazy about and will trade it in the parks. Many Disney fans will tell you that they trade pins in the parks. While I like to pick up a pin for my work lanyard every trip, pin trading has never been something I wanted to do. 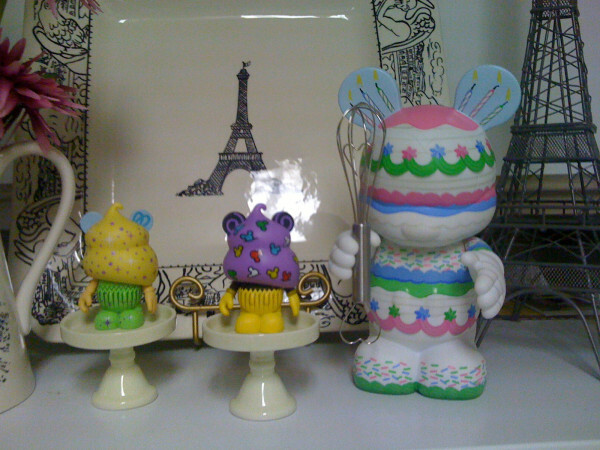 However, November 2010 I decided to pick up a few Vinylmation toward the end of my trip and didn't just *love* the ones I pulled (got out of the blind boxes) and decided to try trading. I was immediately hooked on Vinylmation trading! Surprisingly, my niece and nephew, Katelyn and Joshua, got hooked fairly quickly too, and next thing we knew my brother-in-law and sister were excited about Vinylmation as well! My brother-in-law was the first to point out a cool idea to me: buy a lot (like a set) of Vinylmation on eBay before your trip, and then trade them throughout the trip! Smart, no? Here's the secret: go to eBay.com weeks (or even months) before your trip. Do a search for "vinylmation, lot, -pin". I do the "-pin" because it takes out the Vinylmation pins from your search. From there you can bid on a cheap sets of Vinylmation. Remember, they're usually $10 a pop, so if you can get a set of 5 for $25, you've cut your costs in half. While we like to look for lots that have at least one Vinylmation in it that we like, it really doesn't matter what's in the set since the whole point in buying them is to trade them once you are on vacation. The joy in this is that 5 Vinylmation can last the entire trip! $25 or less for 5 figures that give you multiple instances of fun while on vacation and come back home as entirely new souvenirs can't be beat! I took 4 "traders" with me on my last trip, and while I had a blast trading, it also saved me a nice chunk of change. Instead of buying blind box after blind box trying to get a specific Vinylmation, I traded until I got some I'd been hoping for. Vinylmation collectors have decided that waiting to go to a park to trade isn't enough for them! Many will trade online (I just got one in the mail today that I did a trade for) through websites like Vinylnation, Destination Vinylmation, Vinylmation Station, or Vinylmation World. The Disney Store has also opened up Vinylmation trading (in open trading boxes) in many of their stores and recently had a blind trading event in a store near us. Here is the whole family trading Vinylmation as well as a bit of narration from me as Katelyn and I open some blind boxes. At the end of the video I start getting weird looks because I'm vlogging in the middle of the mall. So aside from a really neat collection for my desk, my whole family has a ton of fun trading Vinylmation. It makes our money go further because instead of buying something new in a shop, we trade for something different. I had a couple of great trades last trip: I found Dodger and Aladdin in open trade boxes, and Kyle picked a number for me in a blind trade, and I ended up with a Steampunk Urban series gears Vinyl. Anyone else trade Vinylmation? What have been your favorite trades? Walt Disney World Shopping Tip #4: Buy lots of Vinylmation (or pins) on eBay before your trip, and then trade them when you get into the parks.